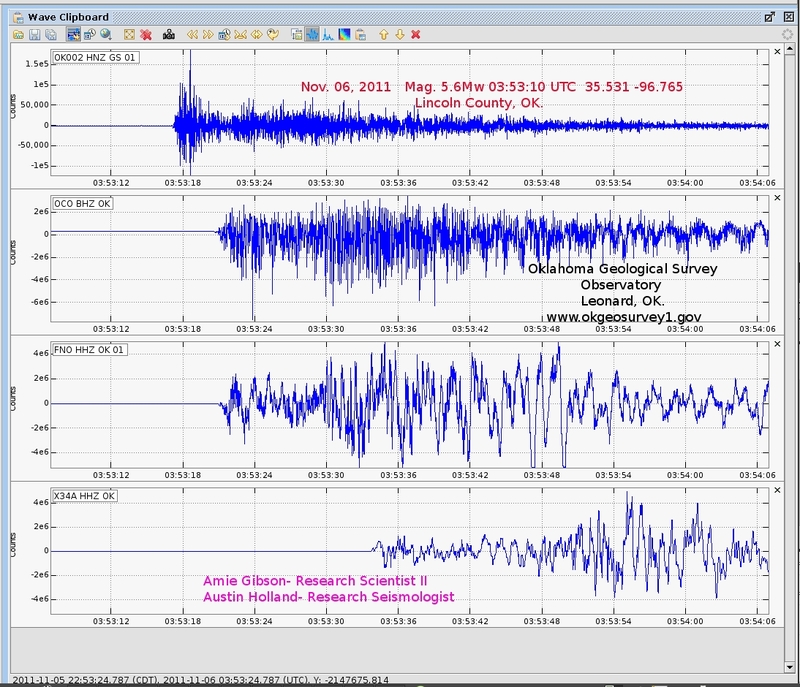 Geology in Motion: Earthquake in Oklahoma! Late Saturday night, the biggest earthquake in history, magnitude 5.6, hit Oklahoma about half way between Oklahoma City and Tulsa. 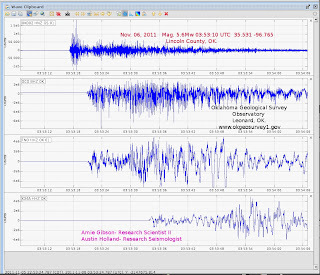 It was preceded by a 4.8 earthquake that morning, itself the third-strongest in Oklahoma history. The big earthquake was about the same size as the one that hit the east coast in August.They were a few miles apart and neither caused injuries or death, although some damage is being reported--buckling of roadways, damaged chimneys, interior damage to houses. The quake was felt in nine states. There have been more than seventy aftershocks as of early Sunday morning. The epicenter was four miles east of Sparks. The morning earthquake was shallow, 3.1 kilometers, and the evening earthquake deeper at 5 kilometers. Both quakes were very near a place where a magnitude 4.3 earthquake occurred on February 27, 2010. They are on the Wilzetta fault, which is also called the Seminole uplift. The first reported earthquake in Oklahoma occurred in September 1918, according to a USGS summary of earthquake history in the state, and earthquakes have not been uncommon in the state. Earthquakes have increased in frequency from about 2009 to the present and there is speculation, though no agreement, on the cause of this increase. The Seminole Uplift is a broad subsurface feature about 50 miles wide and over 75 miles long. It consists of a number of anticlines and "faulted noses" (oil company jargon) that host oil, and the uplift has been a prolific oil source. Many of the wells drilled in the 1920's to 1940's are still producing today and it is likely that there will continue to be speculation on the role of drilling and oil production in causing shallow earthquakes such as those that occurred this weekend. Here's a nice article on the history of oil production in Oklahoma. The geology librarian, Lura Joseph, at the University of Illinois has created a resource of earthquake and tsunami information here. Many of us can't hear the word "Oklahoma" without hearing it as "Oooooooooo-klahoma..." from the great musical by Richard Rogers and Oscar Hammerstein, set outside the town of Claremore in 1906, one year before Oklahoma was granted statehood. The discovery of abundant oil there in 1889 and successive years contributed significantly to the granting of statehood. It's a great fun musical in case you haven't seen it! We're only saying "You're doin' fine Oklahoma"
Susan, as an Oklahoman, I thank you for the info. Do you anticipate more/larger quakes in the area? Hi, thanks for your compliment and comment. I'm not a seismologist, so can't say anything about the future, but the Oklahoma State Survey has commented on how many have been occurring the past two years and I haven't seen anything that indicates that people know what is causing them. Without knowing that, there's no reason to speculate that they'd be stopping. Sorry I can't be more helpful, but Google "Oklahoma State Geological Survey." They are updating things all the time. You know, Oklahoma isn't a state you normally associate with earthquakes. In fact, I lived in Texas for years and don't recall a single earthquake in all that time. Appreciate you bringing us the news. I will be keeping my eyes open for more info on the situation in OK. In fact, I am linking to a list we can all use to help get ready for an earthquake to hit in our area. If it can hit in OK, it can hit anywhere, right? I don't know where you live, but there are certainly some places that have far fewer earthquakes than others. Oklahoma has a history of earthquakes, though none big like California. It's important to find out what the major hazards are in your own geographic area (is it earthquakes or floods or hurricanes, for example), and then prepare intelligently for those. There's a lot of information on the WWW if you Google your state and something like "hazards." Also, every state has its own Geological Survey and they typically have WWW pages devoted to hazards within the state. Thanks for your comment! Just experienced a 4.7 aftershock in Norman, OK. Thanks for the great info! Just had another one at ~8:46 local time, prelim magnitude per USGS at 4.7, equivalent to larger foreshock early Sat am, but less than major EQ Sat nite at 5.6. USGS EQ site had data up less than 10 minutes after the last one. All had epicenters ~5km (3mi), almost to PC basement but maybe in lower-most Paleozoic units. When I finally got around to looking at where the earthquake was centered, I was suprised to find that it was right in the middle of my old Master's Thesis mapping area. So, I dug out my old thesis and had fun plotting the epicenter near where I had mapped the Wizetta fault. Science is definitely fun!